Francis Graham Wilson (1901-1976), an eminent political scientist, lifelong scholar of public opinion, and a central figure in the postwar American conservative intellectual movement, was born near Junction, Texas, to Horace Ernest and Stella Jane (Graham) Wilson. He graduated from the University of Texas in 1923 and earned a master’s degree in political science the following year. He spent a year as a teaching fellow at the University of California, and a year as an instructor at Fresno State College, before pursuing doctoral studies at Stanford University. After earning his doctorate in political science at Stanford in 1928, he accepted a position at the University of Washington. 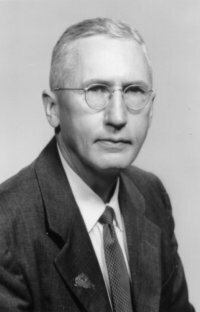 While serving on the faculty, Wilson was a member of the Executive Committee of the American Political Science Association (1937-1940). During this period he was awarded a Social Science Research Council fellowship to study international labor relations. This research, which grew out of his dissertation, was published as Labor in the League System by Stanford University Press in 1934. His The Elements of Modern Politics, a theoretical introduction to the study of government directed against the pursuit of “political authoritarianism,” appeared two years later. In 1939 Wilson accepted a position at the University of Illinois where he would remain until 1967. The transition marked the most significant period of his scholarship and teaching. During his tenure at Illinois, Wilson assumed a nationally-prominent role in promoting the study of political philosophy and humane learning, while also mentoring many students. He would serve as department chairman from 1953-1957. His publications during this period include The American Political Mind (1949), a textbook that articulated many of Wilson’s central arguments about the nature of the American regime; The Case for Conservatism (1951), one of the first defenses of the conservative mission in politics by a postwar writer, which appeared two years before Russell Kirk’s The Conservative Mind (1953) and similarly defended a conservatism grounded in tradition rather than ideology; A Theory of Public Opinion (1962), a major critique of behaviorist methodologies in political science; and Political Thought in National Spain (1967), a work dedicated to reclaiming the enduring insights in the Spanish political tradition. Wilson also wrote two hundred scholarly articles and book reviews. After retirement from the University of Illinois in 1967, Wilson taught at Long Island University from 1967-1970, before moving to Washington, D.C. In Washington, he was a member of the Cosmos Club and he became more involved in political activism, serving as president of Accuracy in Media, Inc., and the Committee on Constitutional Integrity, and as Chair of the Catholic Commission on Intellectual and Cultural Affairs. Since Wilson’s death in 1976, three new or revised volumes of his scholarship have appeared as part of Transaction’s ongoing series devoted to introducing Wilson to a new generation of scholars. These volumes include a new edition of The Case for Conservatism (1990); Political Philosophy and Cultural Renewal (2001), a collection of Wilson’s scholarly articles; and, Order and Legitimacy (2004), a revised and extended version of his earlier work on Spanish political thought. Wilson proceeds to assess the roles of consent, participation, and the historical elements in public opinion, including natural law and theological and political theories, and how the exclusion of these contributing elements to the idea of public opinion has immensely broadened the influence of contemporary behaviorist public opinion research. Wilson believed in the inclusion of values into the field of study, arguing that “central to any theory of public opinion is a conception of value formation,” thereby aligning himself with the earlier contributions of Walter Lippmann and Jacques Maritain in opposition to the advocates of scientific theory as the only measure of public opinion, exemplified in the work of John Dewey and his epigones. Wilson suggested that scientific valuations guided by scientific method would supersede moral and natural law valuations as a restriction upon the function of public opinion. Unfortunately, Wilson opined that if the seminal, consanguineous concepts of popular rule and institutions were not assimilated into all assessments, public opinion theory would concede that there was little absolute truth and moral value in the conduct of the state, placing governmental activity largely outside the realm of ethics. Part II analyzes the development of what constitutes the public, the authentic sentiments of the citizenry, and the complexity of assessing the idea of public opinion. The delineation and elucidation of a definition of the public was essential to the idea of public opinion because “the public is the locus where the drift of symbolism in mass attitudes is arrested by effective decision.” For Wilson, the public is a political and social concept involving groups and the state, but more fundamentally the citizenry. In Part III, Wilson provides a theory for understanding the contributing elements to public opinion, and those sources of interpretation that might discourage a clearer understanding of the genuine views of citizens. One potential source of the current misunderstanding is the influence of psychology upon studies in public opinion research. Wilson suggested that psychology tended to view opinion as a neutral structure or emotional response with some reflective thinking. Instead, Wilson urged the revisiting of the formation of customary habits of thought, and to a limited extent, political tradition. Indeed, Wilson believed custom may be considered evidence of opinion. Opinion is essentially a matter of attitude, he suggested. First come feelings, then sentiments (feelings guided by rational analysis), and then attitudes or patterns of reaction. Attitudes are an organization of feeling and sentiment into consistent groups. In the formation of public opinion, Wilson identified many key factors of influence that are certainly in accord with the tenor of present-day research in public opinion. He posited that the concept of opinion must be distinguished from the government itself, and that the evaluation of the role of government was even more central. The role of the idea of public opinion must flow from the citizenry, or the public, and when this transpires public opinion emerges. The public, with its opinion, becomes a factor in political control. Part IV is a commentary on the future of public opinion in American politics. Here, Wilson is most concerned about the nature of the American voting public; the incumbent lack of political participation; and, problems in the formation of opinion. The contemporary student of the idea of public opinion must acknowledge that majority opinion is not synonymous with public opinion. Public opinion, rightly understood, must incorporate both majority and minority opinion. On the other hand, democratic political life has a central problem in difficulty of accurately detecting and interpreting dominant attitudes. As an advocate of majority rule, Wilson argued although it is not ethically superior, it is essential to deliberative decision-making. The substantive importance of a convergentist view of public opinion to popular rule cannot be diminished, although this mode and concept of participation must be examined anew, given the continuing challenges to American politics. Framing his insight in a distinctly American manner, Wilson combined the most salient aspects of American political thought into a theory of public opinion that is both an endorsement of the role of public opinion, as well as exposing the limitations of purely behaviorist interpretive models. In the process, Wilson helped refine our understanding of republican government, but more importantly, the limits of both mechanistic understandings of public opinion and excessively majoritarian, anti-deliberative notions of popular rule. The Elements of Modern Politics. New York: McGraw-Hill Book Company, 1936. Connecticut: Greenwood Press, 1975; reprint, New Brunswick: Transaction Publishers, 2013 (with new introduction by H. Lee Cheek, Jr.). Political Philosophy and Cultural Renewal: Collected Essays of Francis Graham Wilson. Edited by H. Lee Cheek, Jr., M. Susan Power, and Kathy B. Cheek. New Brunswick: Transaction Publishers, 2001. “Tolerance and Consensus.” Francis J. O’ Malley Papers, University of Notre Dame Archives [Unpublished manuscript]. “The Christian Intellectual.” Five Radio Lectures, Station WILL, University of Illinois, November 1958 [Excerpt published as “The Christian Intellectual,” Modern Age, Volume 5, Number 4 (Fall 1961), pp. 361-372]. “Catholic Approaches to Public Opinion.” Series of lectures delivered at Loyola University of Chicago, March 1962 [Revised and unpublished monograph-length manuscript “The Catholic and Public Opinion,” in Francis Graham Wilson Papers, University of Illinois Archives]. “Concepts of Public Opinion.” American Political Science Review, Volume 27, Number 3 (June 1933), pp. 371-391. “The Inactive Electorate and Social Revolution.” Southwestern Social Science Quarterly, Volume 16, Number 4 (March 1936), pp. 73-84. “Peace and War Attitudes of the Authoritarian States.” Proceedings of the Institute of World Affairs, Volume 15 (1938), pp. 37-42. Number 3 (July 1939), pp. 420-435.
Review of Robert C. Brooks, Bryce’s “American Commonwealth” Fiftieth Anniversary (New York MacMillan Company, 1939), Annals of the American Academy of Political and Social Science, Volume 208 (March 1940), pp. 226-227. “James Bryce: The Years of Reaction.” Journal of Social Philosophy, Volume 5, Number 3 (April 1940), pp. 232-241.
Review of Harold D. Lasswell, Democracy Through Public Opinion (Menasha, Wisconsin: George Banta Publishing Company, 1941), in Annals of the American Academy of Political and Social Science, Volume 217 (September 1941), p. 174. (Winter 1942), pp. 563-575 [reprinted in Communications and Public Opinion: A Public Opinion Quarterly Reader (New York; Praeger, 1975), pp. 500-512; and as Chapter Twelve of Political Philosophy and Cultural Renewal (pp. 191-203)]. “Tradition and Propaganda.” Journal of Politics, Volume 5, Number 4 (November 1943), pp. 391-406. “Public Opinion in the Theory of Democracy.” Thought, Volume 20, Number 77 (June 1945), pp. 235-252. Number 2 (June 1954), pp. 382-339. “Public Opinion: Theory For Tomorrow.” Journal of Politics, Volume 16, Number 4 (November 1954), pp. 601-622. “Public Opinion and the Middle Class.” Review of Politics, Volume 17, Number 4 (October 1955), pp. 486-510. 1. For an succinct presentation of the myriad, interconnected scholarly controversies in American political science, see James Farr, “Political Science,” The Modern Social Sciences, ed. Theodore M. Porter, and Dorothy Ross (Cambridge: Cambridge University Press, 2003), pp. 306-328; and, John G. Gunnell, Imagining the American Polity: Political Science and the Discourse of Democracy (University Park: Pennsylvania State University, 2004). 2. Francis Graham Wilson, A Theory of Public Opinion (New Brunswick: Transaction Publishers, 2013), p. x (hereafter cited as Theory). 3. Theory, Ibid., p. 17. 4. Theory, Ibid., p. 18. 5. Slavko Splichal, Public Opinion: Developments and Controversies in the Twentieth Century (Lanham, Maryland: Rowman and Littlefield Publishers, 1999), p. 97. 6. Theory, Ibid., p. 175. 7. Theory, Ibid., p. 8. 8. Theory, Ibid., p. 15-16. 9. Theory, Ibid., p. 37-38. 10. Theory, Ibid., p. 93. This was originally published with the same title in The Imaginative Conservative on October 2, 2012. Lee Cheek is a Board Member of VoegelinView and Dean of the Social Sciences and Professor of Political Science and History at East Georgia State College and a Senior Fellow of Alexander Hamilton Institute. His books include Calhoun and Popular Rule (University of Missouri Press, 2004) and Confronting Modernity (Wesley Studies Society, 2011), among others.